Beginning a sentence “no disrespect but...”, usually means one thing. It’s one of football’s clichés that is carelessly trotted out, usually just as reputations are shown to matter little when it comes to 90 minutes on a pitch. Let’s turn this particular football speak nonsense upside down, give it a good shake and come up with a new take on it. First weekend of the football season and whilst the premiership nambie pambies are having their toe nails painted, hair weaves shampooed and conditioned and snoods fitted , the Football League gets under way with some crackerjack fixtures and EFW has given me the tough job of picking out the days top Championship game to christen the new season properly. So, no disrespect to former double champions of Europe Nottingham Forest, or to World Cup winners West Ham United, or to self appointed Champions of Europe Leeds United, or to kings of the Football League Derby County or even to recent Premiership entertainers Blackpool, but there is no Championship club we would rather be watching on August 6th than Doncaster Rovers. Other than of course Brighton & Hove Albion, who by fate, fortune or fix, Rovers happen to be playing in the first league fixture at Brighton’s brand spanking, shiny, bouncy new stadium. Why a fix you ask? More of that in a minute. By the way, I happen to think it’s all three, fate, fortune and fix that is. Any type of fixing in football is of course wrong and should be shooed out like the bad smell it is, let’s call this fix the exception that proves the rule. Rovers have heroically established themselves as a good Championship side; it wasn’t always like that though. Doncaster Rovers are quite possibly unique amongst professional clubs in having been eclipsed by their female counterparts for much of the 1990’s. The Belles would regularly give their male counterparts the run around in pre-season kick abouts and it’s a little known fact that several of the ladies did on occasions turn out for the male squad. It was the eagle eyes of a Stockport County kit man who first spotted something suspicious afoot and raised the alarm when he saw chest wigs being laid out with the players’ kit alongside the sock garters and jock straps. He was only prevented from blowing the whistle by a proposition from three of the said ladies which was believed to be too good to turn down for a divorced, balding and overweight 58 year old Stockport kit man. Suffice to say it put a spring in his step, once he could walk properly again, and another footballing scandal was effectively covered up, up until now that is. Why does this fixture have a whiff of the fix about it? Well, if awarding Qatar the World Cup was a fix that stinks of 10 week old rotten horse manure then this particular fix smells of the sweetest English rose. It’s not often you’ll hear these words, so sit back, raise a glass and give three hearty cheers for the authorities for adding a bit of good old fashioned romance and poignancy to the opening day Championship fixtures. Who would have thought that the cold, grey plastic lump of techno wizardy that sends Carlisle to Torquay on Boxing Day has indeed a beating heart full of kindness and sentimentality. Fourteen very long years ago Doncaster Rovers were the last visitors to the Goldstone Ground. What happened that day, and in the years after, meant that there was only one team many Brighton officials and fans had on their list for sharing the first competitive fixture at their new stadium. Fourteen years on it is only thanks to the passion and dedication of both sets of fans that either club exists at all. What’s more, this is a Championship fixture in front of a 22,500 sell out and comes just twelve years after both clubs were slugging it out to see who was the most inept side to grace the professional game. A battle Donny won as despite Brighton’s best efforts they could only manage 91st position two years running, whilst Rovers comfortably held on to the coveted 92nd spot. To say the stakes were high fourteen years ago would be underplaying the occasion. On that day there were four possible results; a win for either side, a draw and if things went horribly wrong the possibility that for the second year in a row a match could be abandoned at the Goldstone. Defeat for the Albion would have meant probable relegation to the Conference, which wasn’t nearly as bad as the thought of having to travel 90 miles to play home games in another county. Of the grounds and towns within a 90 mile radius they chose Gillingham. I know, it gets worse doesn’t it. I’m no Einstein and my mathematic ability doesn’t stretch much beyond working out goal difference, but I think the equation of non-league football + playing at Gillingham + no hope + probably no players would have equalled the end of Brighton & Hove Albion. On a moody, grey, rain soaked and emotionally charged April afternoon the players and supporters of Doncaster Rovers earned their place in Brighton folklore. In a show of solidarity and decency they not only let us win a dreadful game 1-0, they stood up for those who were battling to save a football club. 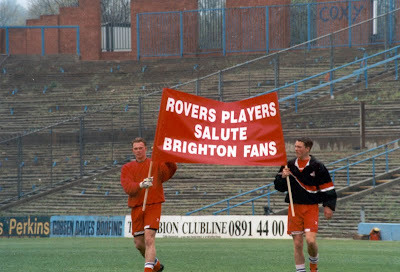 In a gesture which today would no doubt be adjudged as bringing the game into disrepute, the Donny team paraded a banner before the game which powerfully and simply read “Rovers players salute Brighton fans.” That image can still bring a tear to the eye today. The solidarity shown by a fellow club was all the more real as they knew Brighton were suffering a fate that could befall any number of clubs. At the time honoury membership of Clubs in Crisis was limited to a select few, how that has changed as clubs from across the footballing pyramid have clamoured to join the crisis club. Some through greed, some through over ambitious chairman, some through the collapse of TV deals; all share one common factor and that is it’s the fans who suffer the most. Players move on, bent chairman find the next scam. The footballing world, like the world outside, has certainly spun on its axis over these last 14 years. Down in the basement league that year who were the top two? Why, say hello to established Premiership outfits Wigan and Fulham. Dicky Bird and Parky shed Tetley tears as Barnsley clinched a place in the top flight. Who were up there in the top 10 of the Premiership? None over than Wimbledon, not AFC, not MK, just good old Wimbledon. And to go off piste for just a second, a big welcome back to the league fort the proper Wombles this season. Just to re-assure you though that the World hasn’t completely turned upside down; Man United and Arsenal were top and second. Now for my favourite bit, and for the kids this is truly how madcap life following the Albion and Donny was: “Love was in the air. Both sets of terraces serenaded each other, players threw roses into the crowd, rival fans exchanged bouquets and kisses and pop star Louise, squeeze of Liverpool’s Jamie Redknapp, sent her best: ‘Jamie has my heart but Seagulls have my soul.’ Page 3 model Jordan posed in a Brighton shirt. Her message to the players less lyrical, ‘keep your peckers up!’ It was as surreal as the February sunshine...” Keep your pecker up, it’s no wonder pop poet Peter Andre left her if that is what he was serenaded with. After wooing her with mysterious girl you’d think he’d be after a bit more creativity than keep your pecker up. To be honest it’s a shame there had to be a game of football to ruin the fun. Both teams should have run on the pitch – a quick lap of honour, shake hands and call it a draw. We could have been back in the pub by 3.10 and I don’t think anyone would have complained. That day the football didn’t matter. What mattered was that the people of Brighton and Doncaster decided to fight for the survival of their clubs and refused to give up on the hope that there was a way through the carnage and turmoil. Football United will never be defeated. Only the desperate know how real the struggle can be, that’s why fan campaigns to oust the Glazers or other premiership owners will not succeed – life there is too comfortable. The class of ’97 and ’98 take a bow, without you there would be no 2011 opening day celebrations. This was my third visit to the new ground, and as 80’s electro outfit Depeche Mode would say “I just can’t get enough.” It still feels unreal sitting there, in a ground which I honestly thought would never be built. I say new ground as I’m not sure yet what I’m going to call it. The branding and marketing men want it called the American Express Community Stadium. You might get club officials clumsily trotting that out at press conferences, but let’s be honest it doesn’t trip off the tongue does it. So, at a push they’ll accept the AMEX for short. I’m a realist and accept that for new grounds naming rights are now an established part of the deal and help pay for my padded seat. That said I can’t call it that. Its location is Falmer, but grounds can’t be named after a village. Roads and Parks, yes of course, but a village would be stretching it. I’ve made the decision that for the time being it is just so special that it doesn’t need a name. I won’t be telling people I’m off to the AMEX, or Falmer, I’ll be off to watch the Albion in the theatre many thought to be beyond our dreams. Such a momentous occasion does of course merit a momentous pre-match build up. And if we’re honest, if it wasn’t for the frolics and froth that go with pre-match there probably wouldn’t be European Football Weekends. For this one a number of EFW regulars and associates rolled back the years and re-enacted the early Withdean year’s routine. On returning to Sussex from those two dreadful years in the Medway, we celebrated for about five seasons with a pre-match routine that more often than not resulted in the need to check the Sunday papers to see what the score was. I knew if we had won, drawn or lost; but the specifics could be a bit blurry. Stomach lined in the Bystander, into The Railway Bell for liveners at 10.30am with men in brown trousers who look like they haven’t been home for a month, then around the corner to the Caxton Arms where 20 or so of us would turn the place into our private club for three or so hours. The old landlord welcomed the custom with open arms and the entrepreneur in him came up with a drink that he could charge us £4 for and of which we simply could not get enough. It gets better. There were two versions of the drink, home and away. They were known as Zamora’s. The home version - blue Aftershock with a floating top of Baileys to create a blue & white(ish) vision. The away version; yep just replace the blue with red Aftershock. Four or five of these on top of seven or so pints and believe me you are ready for anything; except remembering anything between the hours of 3pm-10pm on a Saturday. Via the Railway Bell and Evening Star we rocked up to the Caxton for the belated 12 o’c opening. New landlord now in situ and before long he was receiving a lesson in cocktail making. At this point we should raise a glass to absent friends; Clarky shame you couldn’t be here, we toasted you. Compadres from the Goldstone north stand are re-united, older in the tooth and some with a new generation in tow. A team photo taken and another moment of history captured. The pubs around the station were all bursting at the seams, it’s a very long time since over 20,000 fans have descended on a Brighton home game. Many of those going today will never have experienced a 20,000 plus home crowd, those who had probably thought they would never see such crowds again. It may seem small fry to the big boys, but trebling your crowds over night is a big deal. The packed, short train ride from Brighton to Falmer is one of anticipation. Thousands are making their first trip to the ground. The atmosphere is Cup Final like; colour everywhere, familiar faces returning to the fold and the expectation is intoxicating. It’s not an expectation of glory, it’s one of pure relief and delight that one chapter can be closed and that there will be another chapter. Nobody used to take too much notice of the results from the opening day games, of course it’s nice to notch up the first three points but just like a park and ride bus after the game there’s another match along in a minute and the chance to get some scores on the doors. Sky’s incessant hyperbole has changed all that, at 3.03 on the first Saturday when the first goal goes in you’ll hear Chris Kamara explode with “unbelievable Jeff, if the season ended now would be playing Premiership football.” The live league table will flash up and the team one down will be calling for the head of the manager as they languish in the early doors bottom spot. All after three minutes. They never used to bother with the table until after three games. Phone ins and message boards will be awash with depressed / elated punters and inevitably all sense of perspective is chucked well and truly out of the window, as it will be every week between now and May. Welcome back to the football season after what has seemed like the longest close season ever. When clubs dish out the flags for a champions league shindig it looks a bit cheap and desperate. It can smack of a last ditch attempt to inject a bit of atmosphere into a dead end no-one could give a hoot qualifying round match. So, I was bit apprehensive when I heard that flags were the order of the day. Fair play though, they worked and added to the theatre and atmosphere and created an almighty buzz around the ground. The new massive screens played a greatest hits of Albion moments, including Storer’s goal against Donny 14 years ago, and pumped to the full 20,000 Albion fans roared the team into the new era. As ever with our match reports we issue the EFW statement that if you want to know who played well, who won the tactical battles and who lined up 4-3-3 or whatever, then re-tune now. People are paid to knock out that nonsense. We pay to drink, sing and be merry. The early exchanges were even, though Rovers settled into the groove of the new season and looked likely to spoil the party. The Rovers fans, looking like a Where’s Wally convention in their red hoops, were warming to the occasion. Albion’s loan star from Newcastle, Lua Lua, was getting outmuscled and out manoeuvred and it was no surprise when Billy Sharp pounced to give Donny the lead. Albion had their chances, but the shots lacked snap and they went in one down and with manager Poyet banished from the bench, probably not for the last time this season. So, to cut a long story short. Sadly for Donny fans and football fans in general, shortly into the second half Billy Sharp was stretchered off. Rovers never looked the same without him, and the eight minutes it took to treat him came in handy for the Albion. The pressure built, the noise from a packed stadium built to a crescendo. Poyet introduced new signing Will Buckley, and immediately his size and pace made a difference. Noone was creating and Buckley gave an outlet. The 82nd minute saw the stadium erupt in unbridled joy. The 97th minute saw the hinges shake and the roof take off. From one down, Brighton were two one up and the stadium bounced. Sense of perspective? Nah, this wasn’t about the season ahead, it wasn’t an indicator of how Brighton would cope this season, the steam valve of 14 years of frustration had been released and that steam was still blowing into the Sussex skies in the early hours of the morning. Twelve years on from the nadir these two clubs served up a great game of football, played in a great atmosphere. You’d have got long odds on this all those years ago, good job Brighton chairman Tony Bloom is a betting man. He knew the odds and knew he was on to a winner. Great occasion and fairytale ending to the game. Cheers from Bulgaria,first comment here. This was the best,most heartfelt, post I've read in LOOONG time,football related or not! EFW is top class overall,keep up with the good work!